Oooh! I love finishing a project that I featured as a Queued item. This time, I'm happy to report that Texelle is off the needles and blocked! I love the finished product. It's warm, soft, and a beautiful color. A friend on Ravelry mentioned that it looks like soft metal, and I can definitely see that. Ahab is much greener in the skein than I thought it would be, but knitted up, the light and dark areas blend together really well. It's an idea semi-solid, with subtle heathering, which is SO HARD TO FIND in semi-solids. Andrew and I went to Galveston this weekend, which is about 45 minutes from Houston. While the dogs went crazy on the beach, I got a few quick snaps. 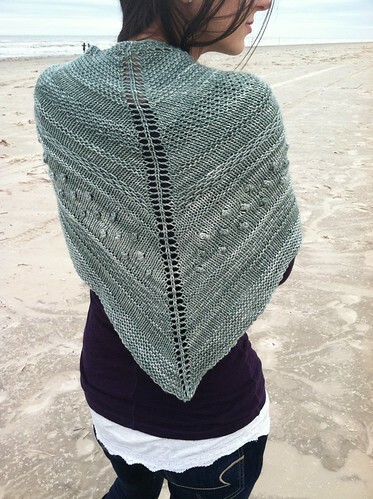 I was surprised at how well the shawl warmed me up. So happy with the textures, and the lack of lace!!! 2) Throw "front" end across chest, over right shoulder. 3) Lay "back" end on top, over the right shoulder, and let it hang down. 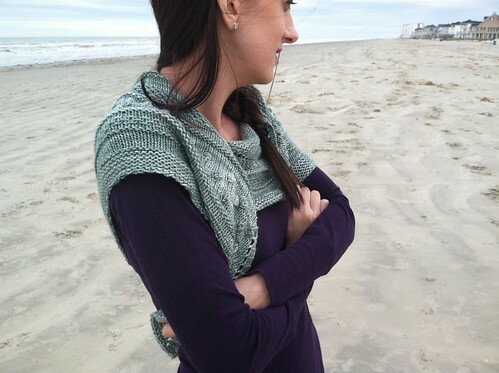 With this wrapping style, you get to see the edging and ends from the front, and the dramatic center yarn overs aren't cutting your back in half. Love it! How do you wear your shawls? 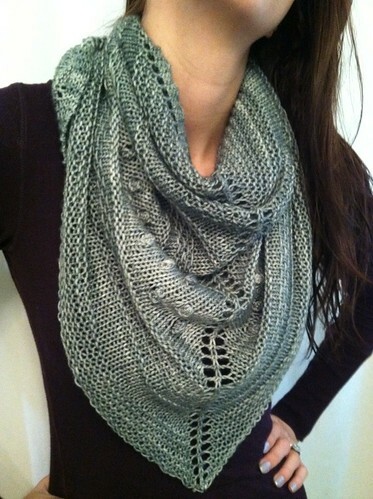 Beautiful, and I love your tip on how to wear a shawl. I love making them but the traditional way is not for me! I agree! The "granny" style is super hard to pull off in a fashionable way, in my opinion!